Most of the safety liners that were made in the past and still being made today usually rip on the corners and they are not as deep as the frame. This new safety liner is very large improvement compared to the others that are available. Keep in mind a quality safety liner is what will prevent water from going into you platform and onto your Floor if you have a leak. *5 Year Warranty. *In Stock For Fast Service. *This heater is for Hardside Wood Frame Waterbeds & deep fill Softside waterbeds. *Waterbed heater works with California King, Eastern King, Queen, Full & Super Single/twin. *Easy To use & Install. MattressCover.com : Hardside Mattress Cover, this Organic Cotton Mattress Cover is very breathable & soft. Top unzips off without having to drain the bed. Helps protect your mattress from punctures. Insulates waterbed mattress; heater turns on less. European 220-240 Volt Outlets. Works with hardside and softside waterbed with one or two bladders. 5 Year Warranty. For international orders email us. This water bed heater is very reliable. Calesco is excellent manufacture. Digital Waterbed Heater ~Very Accurate & uses less energy than other models. 5 Year Warranty. Includes control & heater pad. Work with all hard side water beds including these sizes. California king 72 x 84, Queen size 60 x 84 and Super Single 48x84. 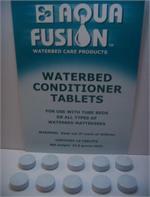 Ten 4oz Premium Line Aqua Fusion Waterbed Conditioner. Made With Pride In the U.S.A. Work With Hardside mattresses & Softside waterbeds. Excellent for free flow or waveless mattresses and bladders. We have it in stock for fast service. Electric Waterbed Pump Pumps 360 Gallons per Hour. This pump will drain your waterbed mattress Fast and Easy. Works with free flow or tough to drain waveless water mattresses. It can also be used to drain or move water for many other reasons. 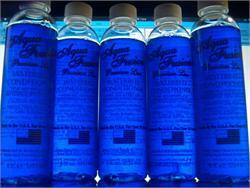 5 Bottles of 4oz Blue Magic Sapphire conditioner. *Easy to use. *Blue Magic is a name that most waterbed owners know. *This conditioner will keep the water in your water mattress clean. *Use it every six month & add years to the life of your mattress. 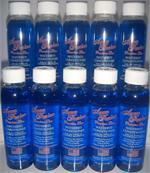 Five 4 oz Premium Clear Bottle Waterbed Conditioner Helps prolong the life of your mattress. 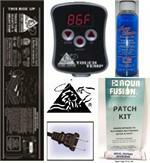 Easy to use Made In the U.S.A. Aqua Fusion has been manufacturing quality products for over 35 years. Fresh From the manufacture. 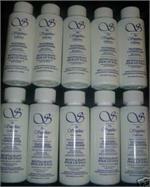 Aqua Fusion large conditioner tablets Very easy to use Made in the USA. In stock for fast Service Perfect for softside waterbeds with tubes or cylinders. Also works w/ dual bladders waterbed mattresses. In stock for fast service. 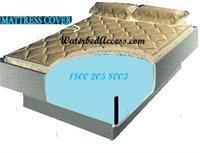 Zipper Mattress Cover For Hardside Waterbed mattresses is quilted & designed to protect you water mattress while creating a soft layer between you & the mattress. Your heater will turn on less & your sheets will stay in place better. 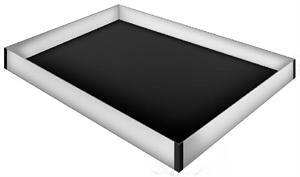 Made in the U.S..
Cap and Plug fits California king, Queen and Super Single Hardside Waterbeds. It also works with Softside Waterbed with a Single Bladders, dual bladders & Tubes in eastern king, Cal King, queen, full and twin size. We have it in stock & we ship fast.